KittyKat Glass Designs: Happy Birthday to Me! 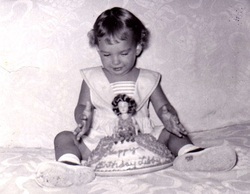 Today is my 60th birthday. I've come a long way baby! Over the years, the dreams changed - I wanted to be a nurse, then a teacher (didn't every little girl in the 50's?). I tried that in college and hated it. Then once I discovered music, I wanted to be a piano teacher - which I also did for a while. It was hard trying to remember what it was like to not know what all those strange marks on the page meant. I finally graduated from college in 1994 with a degree in Organizational Management. At that point in my banking career, I really didn't need a degree (I was already a Vice President), but I went ahead and did if for myself - and my parents. Unfortunately, my father died two months shy of seeing my get that diploma. Today, I am finally doing something I truly love - designing and handcrafting jewelry. How I wish I had known that when I was 18! I always wanted a birthday cake like that. Guess that was good for a little girl. The purse cake fits you perfectly now. I've never seen a shoe cake! Your lastest designs are terrific!